One week in March of 1990 I suddenly found myself skiing in Snowbird, Utah in a total white-out blizzard. I could not see 3 feet in front of me and had no idea how to get down the mountain. I am still grateful for the divine guidance, the inner voice, that guided me to run left and literally ski into 4 snow covered people from Australia. It was one of those day that skiing alone was truly dangerous so I asked this group of skiers if I could ski down with them. Doing so started a week what would wonderfully change my life! For 6 days we skied, partied and laughed and I had more fun than at any other time in my life!!! Why it stands out as such vivid memories, in addition to the skiing being fantastic and the laughter and fun a full 10 on my joy meter, is that the morning the Aussie’s had to leave, after saying good-bye, I went back went to my hotel room to meditate and during the meditation I had a vision that has stayed with me all these years. This vision and the sense of connection with God/Source that it creates within me has become a part of my daily meditation. Plus, the gift I was given by this experience is a core piece of what I teach. It is also a part of the message in the book I wrote, Take Two Cookies and Call me in the Morning, A story of how to connect in a disconnected world. During the meditation I learned that “God is a GIGGLE.” “That the emotions humans feel when sad, depressed, grieving or angry all might motivate us to turn to a Higher Power for comfort, for answers, for a sense of connection, etc. But the sense of CONNECTION that we experience when we are in our joy and laughter is the real sense of Love and JOY that is the powerful creative energy that we call God/Source”. This message came to me with a vision of me walking hand in hand with God/Source as my partner. Not something separate from me that I have to seek, but as me in partnership with the Universal Source of Energy that is within ALL of us and within everything. Because of the vision I had that morning (and still see daily) and the powerful life changing experience that the vision created, I just ‘knew” that I wanted a life of JOY. In that moment I knew I was embarking on a journey to release ALL that blocked me from a life of JOY and Inner Peace. I am able to report it has been a long, hard, challenging, exciting and worthwhile journey. 4 months later in July 1990 I left working for the Ski Tour Company, Ski Organizers, Inc., that I had started in 1980 and had sold in December of 1988. I bought myself out of the contract, working for the new owners was not joy. The week with the Aussie’s and the meditation experience had changed me and I knew I was ready to move on. By the Fall of 1991 I had done enough training in the new field of Energy Psychology to go in to private practice. I had actually in 1988 started training and working part-time in this field before I sold Ski Organizers. In 2018, 30 years later, am still counseling, teaching my 6-month Spiritual Awareness Training, writing, and I still start each day with the vision and awareness that God is a giggle and that I walk with God and God walks with me. It’s a profound partnership that I daily call upon. In any moment by using the vision I was given in that meditation in 1990 I can relive and feel the connection and the Oneness of my universal unity. I have 4 wonderful Australians, whom I have never seen again, to thank for teaching me that fun and laughter is the door to God Consciousness, not pain and sorrow! 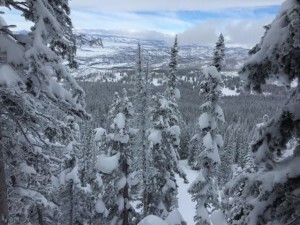 At 69 I still ski, even in white-outs, because skiing with good friends is what gives me the greatest sense of joy and connection. What does it for you? Are you making that a priority in your life? If not, why not? Pain and sorrow causes us to slow down and seek a greater connection with Source, friends and family. But it is the positive fun filled CONNECTIONS with people, nature, and animals that creates the experience of love and joy! “Love is the wonderful experience of feeling connected. Learning how to connect and live in the loving is the journey called life!’ Quote from Take Two Cookies and Call me in the Morning, Dr. Nancy R. Harris, DSS, Richer Life Publishing.